The simply named Fin Art in Seattle’s Magnuson Park is a larger-than-life work of recycled art that turns a grassy field into teeming ocean. 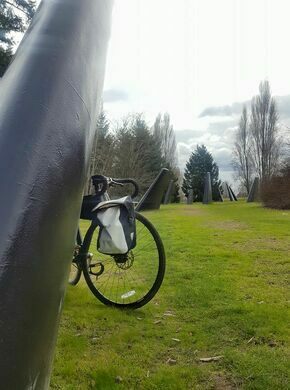 Located just off the shore of Lake Washington, the large, black shapes that comprise the public art piece resemble nothing so much as a pod of killer whales, peeking their fins above the waterline. Upon closer inspection, what seemed to be fins are revealed to be painted metal monoliths planted in the ground at irregular angles and intervals creating a sense of live motion. The pieces are in fact decommissioned submarine wings that each weigh 10,000 pounds. This use of military ordinance to create public art which celebrates life is far more affecting than the simple title of Fin Art would suggest. North of the swim beach on the east side of the park.